There are some cool things going on in space exploration, and these are developments that involve true exploration. There are also a lot of things going on behind the scenes regarding how the National Space Society operates, and these can get rather tedious. First, the awesome stuff. We are getting our first close look at two very interesting solar system bodies, Pluto and Ceres (not to mention Pluto’s several moons). Ceres, with its mysterious bright spots, get more and more intriguing as the images continue to get better. As the New Horizons spacecraft approaches Pluto, we are finally starting to see the dim planet’s personality take shape. The next couple of months will be fun and exciting. There have also been some interesting developments in experimental space technology. The privately funded LightSail, a cubesat sponsored by the Planetary Society, successfully deployed a solar sail in low Earth orbit in early June. This technology has the potential for low cost, deep space missions with this new capability to move around the solar system. There are constraints, certainly (you don’t get anywhere fast, and it doesn’t work well in the darker deep reaches of space), but it is great progress. It is also refreshing to see success by a non-government sponsor of such technology. Another technology demonstrator, NASA’s Low-Density Supersonic Decelerator (LDSD), did not fare so well. This inflatable heat shield and high speed aerobrake was tested again near Hawai’i, but the supersonic parachute disintegrated shortly after deployment. They had similar issues on a previous flight, and despite what might be considered a failure, this is how you learn. By observing a failure, you understand the limits of the design, and can now go back and fix it. These demos are great examples of how we are advancing the technology that will expand humanity into the solar system. But on the policy level, I don’t think we are making as much progress. I think most people can agree on the goal of expanding mankind into space, but not on the path to get there. You have factions supporting SLS or commercial space, NewSpace versus traditional aerospace firms, etc. This week I was observing an email debate between lunar railguns versus lunar space elevators. In my view, that is a moot argument (especially for a forum on chapter issues), since neither one is going to happen any time soon. There was also a debate on how NSS should deal with the partisan bickering in Congress over NASA’s budget. I doubt that NSS has any influence over the eventual outcome, but we sure wasted a lot of energy arguing about it on teleconferences and emails. From my perspective as the local leader of the Phoenix Chapter of NSS, I am looking for ideas and resources from my NSS national leadership on how to sponsor effective local events, how to recruit more members, etc. While lunar elevators versus railgun launchers may be an interesting academic discussion, that is not helping me figure our how to convert some new young space enthusiasts into future leaders of NSS at the local or national level. I fear that if these young candidate leaders are exposed to the constant internal bickering, pointless debates, and ineffective meeting management that is so typical of NSS, they will want nothing to do with the group on any level. As an organization, NSS needs to grow up and become more professional in how they set policy, support local chapters, and establish their public image. The Society’s tedious tendencies in these areas may be the very reason there are so few younger people willing or interested in becoming more active and involved. Chairman Lamar Smith (R-Texas) has split the Energy and Environment subcommittee into two separate subcommittees, resulting in six subcommittees in the new session. The Space and Aeronautics subcommittee will continue to be chaired by Rep. Steve Palazzo (R-MS). The complete list of assignments is listed below. Rep. Eddie Bernice Johnson (D-TX) was reelected as the top Democrat (“Ranking Member”) on the full committee in December. Democratic subcommittee assignments have not been announced yet. This Sunday, January 6, 2013, 12-1:30 PM PST (3-4:30 PM EST, 2-3:30 PM CST) Paul Damphousse, Executive Director of NSS, will be interviewed live on The Space Show. Listeners can talk with Lt. Col. Paul Damphouse or the host and express their views using toll free 1 (866) 687-7223, and by sending e-mail during the program using drspace@thespaceshow.com, thespaceshow@gmail.com, dmlivings@yahoo.com. You can also use Skype from your computer with a headset. The I. D. is thespaceshow. Please note that Skype is only available when announced as such at the beginning of each program. Please note the toll free number is only available during a live Space Show program. At all other times, it is disconnected. Emily Lakdawalla, at the Planetary Society, published these stunning images of the asteroid Toutatis (captured by The Chinese spacecraft Chang’E 2) as it tumbled past the Earth on 12 and 13 December 2012. Chang’E 2 was originally launched on 1 October 2010, and mapped the Moon during an eight month mission. China published these high resolution images of the Moon earlier this year. Now, Chang’E 2 has become the first spacecraft to reach the Sun-Earth Lagrange point (SEL-2) from lunar orbit. It departed lunar orbit in June of 2011. The world was caught completely off-guard by this low profile fly-by of the asteroid Toutatis. At closest approach, Chang’E 2 was 3.2 kilometers above the surface of the asteroid. The images were taken from a distance of 93 and 240 kilometers. 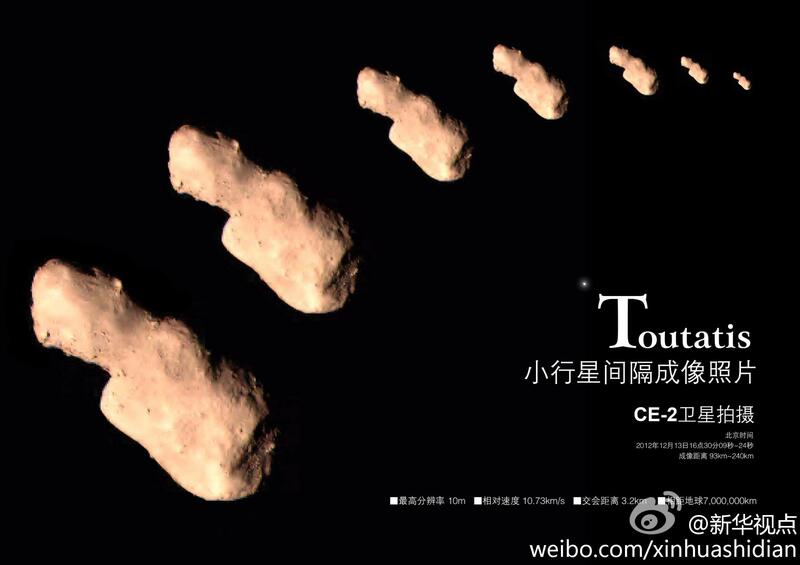 China becomes the fourth country to observe an asteroid, after US, the European Union and Japan. In January, Chang’E 2 will reach a distance of 10 million kilometers from Earth. Additional details have been published by Xinhua on their website, and at Discovery.com. In August, Bill Gray at the Planetary Society, published an update on the Chnag’E 2 mission. Sky and Telescope has also weighed in with unique information on the fly-by. The passage was so close that the deflection in the trajectory of the spacecraft could be used to determine the gravitational mass of Toutatis, which in turn would yield the overall density, a key to understanding its bulk composition and internal makeup. There are many ways folks express their interest in the space program. Some space enthusiasts read everything they can find and often have a large book collection. Some people accumulate souvenirs and autographs. Photos, patches, and pins are popular collectibles. Scale models can be another way to bring the space program to life in your home or office. I have been inspired by space exploration since I was a youngster. Prior to finishing school and entering a career in aerospace engineering, my participation in the space program was limited to building scale models of the vehicles that were leaving the planet. Actually, I have never stopped building models of spacecraft, even while I build them for a living as an engineer. Like engineering, I find that modeling is just another expression of one’s creativity. Over the years I have been participating in a network of other hobbyists with similar interests. What I have found is that many of these people, while being hobbyists and craftsmen in terms of their model building, are also passionate about space. My situation is a bit unique in that space is both my hobby and career. 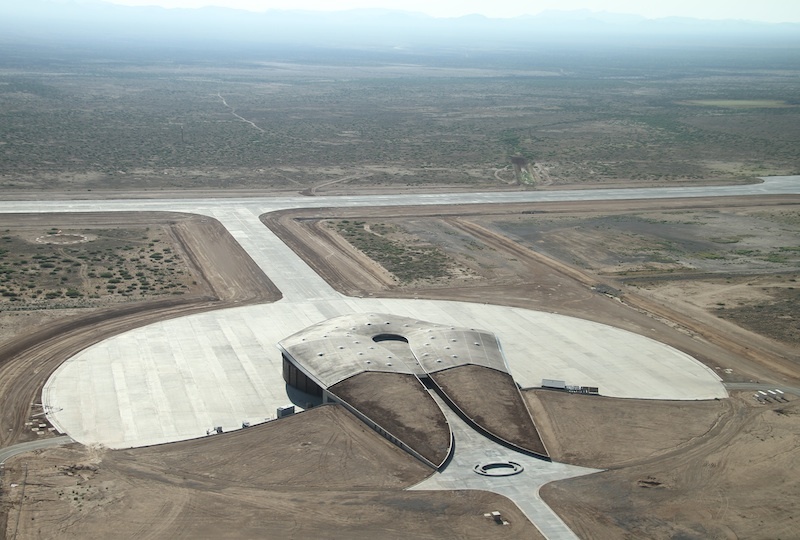 Most people who are passionate about space have other, usually non-technical careers. So one way they can feel closer to space exploration is by building small replicas of the hardware that makes it possible. Certainly this sort of passion is the root of many hobbies. Military history buffs build models of tanks and fighter jets. Auto racing enthusiasts build race car models. Would be sailors rig up miniature ships and sailboats. People collect or paint miniature horses because they cannot afford to own a real horse. Airplane fans who cannot afford lessons or a plane can have a shelf full of models. Frustrated astronaut candidates build Apollo lunar modules and space shuttles. It’s not the same, but for many people it may be as close as you will get. It’s your own personal space program. Enthusiasts want a piece of the space program they can see up close, hold in their hand, and relate to three dimensionally. Books and videos and internet sites are flat and virtual. A model is real and fills space. And you built it yourself. That’s why model building is more fulfilling than just collecting or buying pre-built souvenir models. You are now a rocket scientist, only scaled down, and with simpler technology. You have combined art with technology. You feel more a part of the movement, a part of the collective that is moving out to space. Through model building, you are more than an observer. You have made a statement, that by building this miniature monument to space exploration, you are supporting it, and proclaiming it to whomever enters your hobby room or office or wherever you chose to display your work. If you can’t be an astronaut or be an engineer in the space industry, you can have your own little private miniature space program, and thus pay homage to whatever past or future off-planet venture that inspires you. In that way, maybe it will inspire someone else, and the movement grows by one more.